LENIN'S TOMB: The smallness, fear and resentment of the paid columnist. 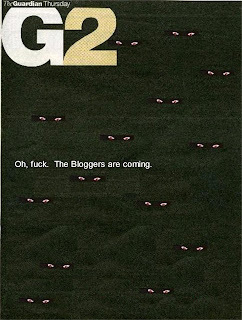 A heartening stream of recent complaints about bloggery, including the charge that blogs often contain mistakes (whereas printed column inches foreswear all error); are insular (whereas the media class wouldn't know the meaning of the words 'navel-gazing'); are abusive, (whereas the daily newspapers are not packed with a million and one petty slanders); are irrelevant (the blogosphere's spectacular growth being unworthy of contrast with the contraction of the audience for newspapers); are parasitical on 'old media' (the average columnist being not at all parasitical on the industry's product, and not at all leeching off the blogosphere for the occasional bit of controversy). To be sure, blogs can be all those dreadful things, yet a moment's reflection indicates that they can also be a source of untold stories that need to be told, vectors for the disclosure of valuable information, forums of more or less modest investigative journalism in their own right, providers of an alternative analytical frame to that usually imposed on events by the capitalist media, sources of humour and release from the humdrum and mundane and so on. It so happens that the most worthless, trivial blogs are usually the ones patronised by the media outlets that are now skidding their undercrackers. Why, then, waste time with these tedious, banausic complaints? Well, they happen to coincide with, or are prompted by, a move to create a bloggers' code of conduct, something that the cretins hope will be taken up by the service providers. It says 'voluntary' now, but if it were to be taken up by, say, Blogger, it would conceivably involve a more widespread pulling of blogs, especially if complaints against them were lodged by journalists or states. This is something that some undertalented and overexposed columnists could regard with some relief. Their effort to denigrate such popular participation in online comment as exists simply provides a background score for the wider effort to bring the internet under control, to reduce popular participation to an endless exchange of moderated opinion, a feedback chamber for the advertisers, and a gentrified nattering zone for those who imagine themselves uniquely placed to pronounce on public matters, because News International, the Washington Post Company, the Guardian Media Group [etc etc] says they are.